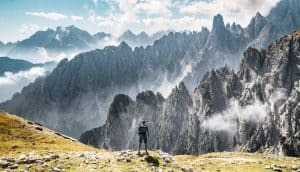 Hiking poles are an incredibly important piece of gear because they provide stability and support on the harshest of terrain. 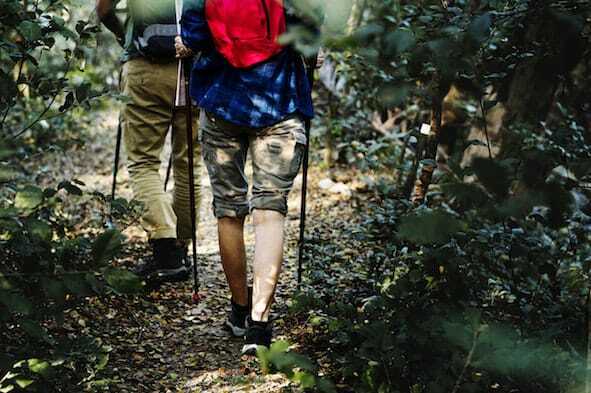 While some hikers brush poles off as unnecessary, they greatly enhance your ergonomic efficiency, reduce pressure on your knees on the downhill, and engage your core for a more natural stride on the uphill. 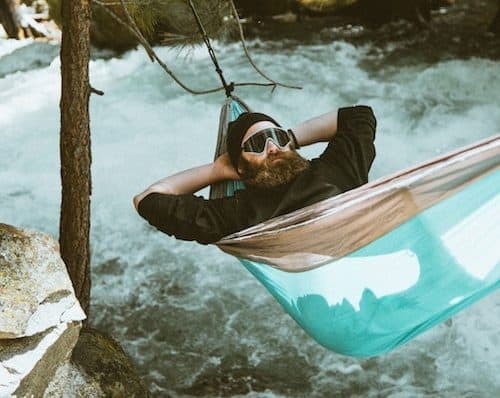 Although trekking poles may seem like fancy replacements for the humble downed tree branch, they’re actually quite advanced pieces of equipment. 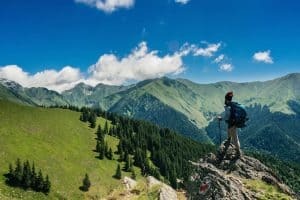 There are a variety of different styles and types of trekking poles, each with specific features to help you get the most efficient stride possible. 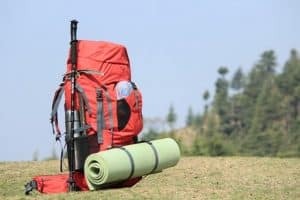 To help you choose your next set of hiking poles, we’ve compiled this comprehensive buying guide, so you can know before you buy. After the summary table below, we discuss the key things to consider when choosing hiking poles, followed by our detailed reviews. 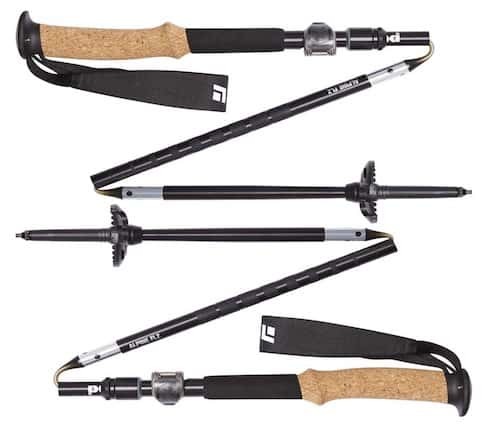 Some trekking poles are single-piece designs that don’t adjust in length while others come in 2- or 3-piece formats. Non-adjustable poles tend to be fairly light and a bit more durable than the adjustable variety. But, this weight-savings is a major trade-off. When you can’t adjust your pole height, you can’t make them shorter for the uphill and longer for the downhill, which can make you a more efficient walker. These days, many hiking poles fold in a ‘Z’ formation instead of telescopically collapsing. The folding design often means they’re much more packable and very light. However, folding poles tend to be less durable, non-adjustable, and more expensive. That being said, they are very popular amongst the ultra-light crowd and are great with a little extra love and care. Some poles come with an internal spring that absorbs shock as you walk downhill. This can be a great feature if you have chronic hip, knee, or ankle issues. 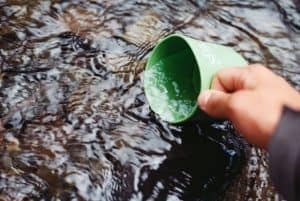 You can often turn this feature off on the up-hill. The downside: they're usually more expensive and slightly heavier. Many more affordable pole shafts are made of aluminium, which is light and very durable. The more expensive varieties are made from a carbon composite, which is super light, but prone to breaking under excessive loads. Trekking pole grips are another consideration. Cork is often considered the best material as it is light, wicking, and conforms to the shape of your hands. Rubber grips are great insulators from cold, shock and vibration, but they are likely to chafe or blister your hands. 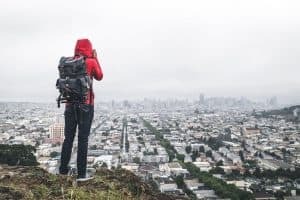 Keep these features in mind as we transition into reviews of the best hiking poles on the market. ​The Trail Ergonomic Cork poles from Black Diamond are a new take on a classic design. With a three-piece adjustable aluminium shaft and a 15-degree angled cork grip, these are durable poles designed to take a beating. The angled cork grip places the wrist in a neutral and comfortable position while the no-slip foam on the upper shaft provides support on steep climbs. An adjustable flick lock system makes these poles easy to adjust on the fly, so you can keep moving. 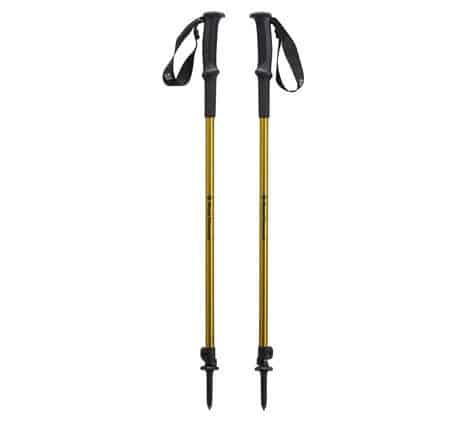 These poles are a great buy for hikers who need something simple, reliable, light, and comfortable. "I’ve used two renditions of this pole for years, and they’ve never let me down. From alpine scrambles in the Rocky Mountains, USA to the Himalaya of Nepal, the only sign of wear and tear on them is some scratches." ​Leki packed the Micro Vario Carbon poles full of high-end technology. Made from a 100% carbon shaft with a light rubber grip, these poles are designed to fly up hills. They use a push-button release system for quick assembly and disassembly into their super compact folded shape. Even though they're foldable, the Micro Vario Carbon poles are adjustable by 20cm to help hikers get the perfect fit. Their rubber grip has a 15-degree angle for comfort, too. The downside: they have a hefty price tag. But, if you value quality and lightweight materials in your hiking poles, the Micro Vario Carbons might be the poles for you. "Leki is world-renowned for making some amazing trekking poles. If you choose a pair from Leki, you won’t be disappointed, but you might be shocked by the price tag. You get what you pay for though!" ​These ultra-light aluminium and rubber trekking poles from Leki are made with a Dynamic Suspension System (DSS) that softens your impact on the downhill for extra comfort. They're fairly adjustable using their speed lock clamp system, so you can get the perfect fit. 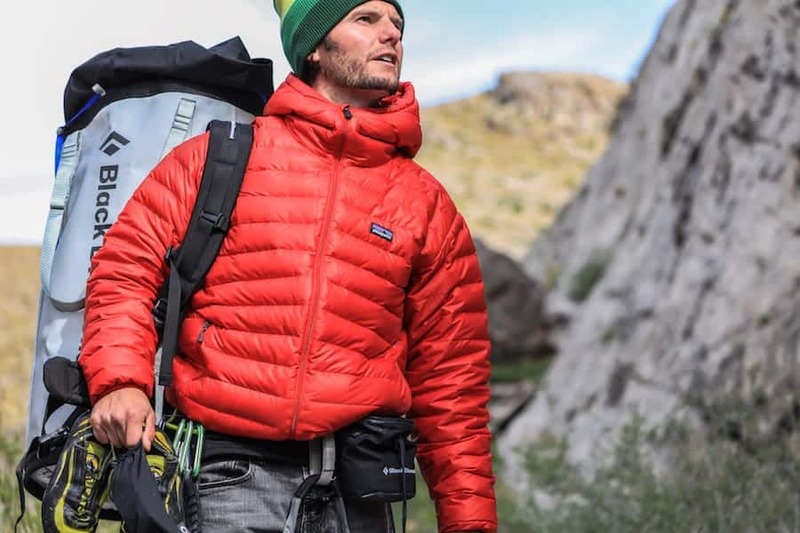 The Thermolite XLs come with an extended grip down the pole for ascending steep slopes and the pole strap is lightweight and breathable to keep you cool on hot days. 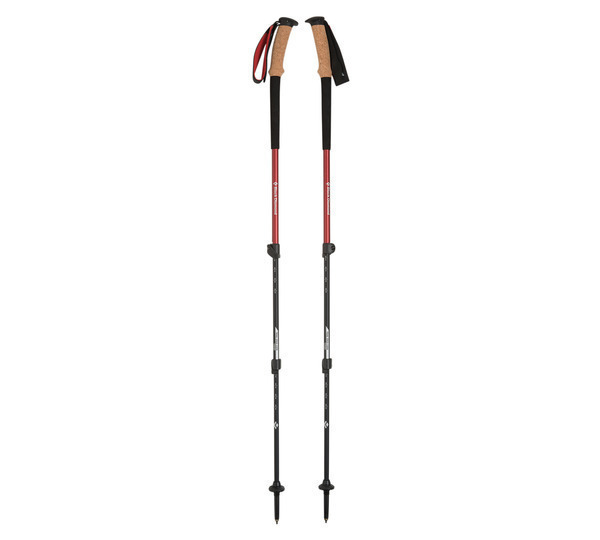 These are a great option for hikers who want a lightweight pole without the price tag of a carbon or foldable model. A true four-season pole, with the Alpine FLZs, you can swap out the mini summer baskets for larger powder baskets when in deep snow. Black Diamond also made these poles a bit stiffer to add some extra support for year-round durability. We'd recommend these poles for serious hikers who are concerned about weight but don't want to compromise on durability. ​The Trail 2 is Black Diamond's simple, affordable, no-frills hiking pole. A classic two-piece adjustable design with an aluminium shaft and rubber grip, there's nothing flashy about the Trail 2. Even though it’s simple, the Trail 2 is a durable workhorse that can handle tough conditions with ease. The flick lock system is super adjustable, and the nylon webbing strap is comfortable even after extensive use. This is a great pole for new hikers and seasoned trail veterans, alike, who value durability and affordability over everything else. 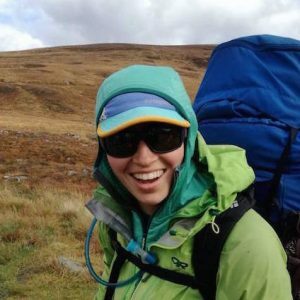 ​Ultimately, there can be only one victor in this head-to-head hiking pole match up. Our top pick is the Black Diamond Trail Ergonomic Cork because it combines a durable design with useful modern features. Its lightweight aluminium and cork construction reduces the gram count without sacrificing toughness, so you can feel comfortable on any trail. The three-piece telescopic design is compact and easy to use. Whichever trekking pole you decide on, be sure to choose one that has the right features to meet your needs. Be sure to balance the desire for a super light carbon pole with the benefits of durable aluminium. Consider how and where you'll use the poles to find the right fit and you won't be disappointed.